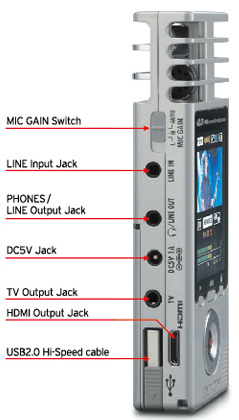 I’m always complaining about how most consumer-level camcorders don’t feature microphone inputs, or even decent mics. My Sanyo Xacti VPC-CG10 has pretty good mics for camcorder of it’s size and price. But because the mics are on the camera and there’s no input to add an external mic, they’re still inappropriate for interviews or any sort of shoot where you need to record voices clearly because the mics will be too far away. I’m a big fan of Zoom’s portable digital audio recorders — I’ve been using the small Zoom H2 for a couple of years now. Last year Zoom released their Q3 “handy video recorder” which added a standard-definition camcorder to a high-quality stereo audio recorder. Strangely, the Q3 lacks a microphone input, although its mics outclass anything on a camcorder. Now Zoom has upped the ante by adding HD to create the Q3HD, featuring full 1080p HD video. 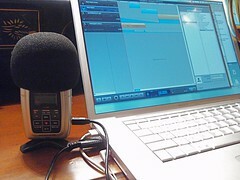 I’m surprised that the Q3HD still lacks a microphone input, however it does add a line input. In its promotional literature Zoom says that the input is good for recording multiple microphones using a mixer “for sophisticated recordings.” While this is certainly useful, I question whether someone using a tiny hand-held camcorder wants to drag around a mixer and multiple mics just to get better sound. Being able to just plug in a single lavaliere mic would be much more practical. Like most Flip-style camcorders the Q3HD has no optical zoom, and doesn’t seem to have much in the way of manual control over the video. So, in essence it’s a Flip camcorder with vastly improved audio. I think it would be vastly more useful if Zoom were to combine something like a Sanyo Xacti style camcorder, that has an optical zoom, with the enhanced audio recording of their “handy recorders.” That would really make for a DIY videographer’s dream pocket camcorder. The Q3HD is supposed to be available by the end of the year for $299. My guess is that the street price will be a good bit lower than that. However, I’d gladly pay $300 or a bit more for my dream of an Xacti + Q3HD. I have emailed Zoom asking them if they would consider including an external mic input. I guess their thinking was that if they provide high quality microphones on the unit, why would you want to plug your own in! But when interviewing people in a noisey environment, you really do require a separate mic that can be held close to the mouth of the person being interviewed. I’m yet to come across a small video recorder with a mic input (for me, the sound quality is more important than the video quality) at the $200-$400 mark.